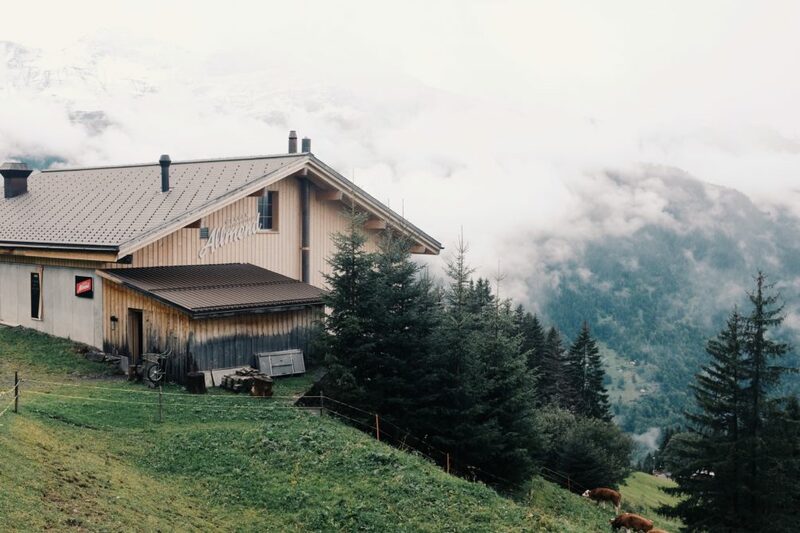 Thinking about planning a getaway to Switzerland? If you are, get ready for lots of scenic train rides of picturesque mountain villages and lovely cows. 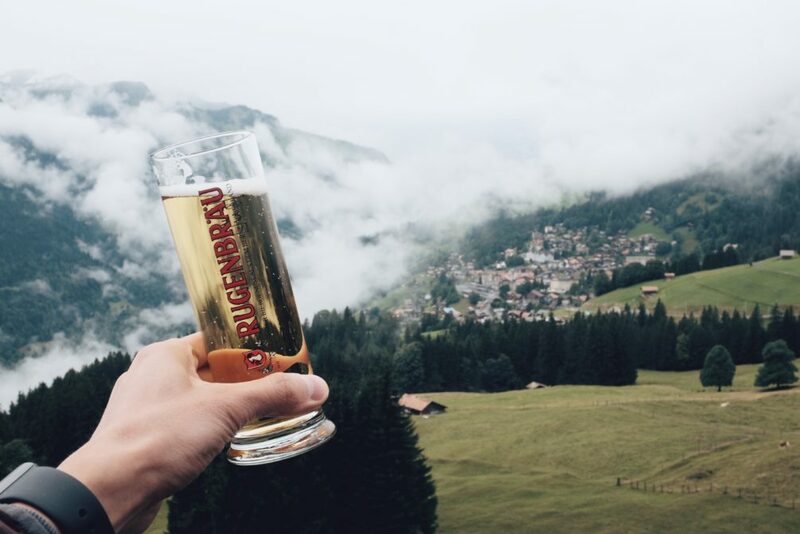 Switzerland really does live up to its image of quaint country living that you might recall seeing in Ricola ads or old Heidi picturebooks. But you can only handle bucolic beauty for so long, what if you want more of an urban scene? 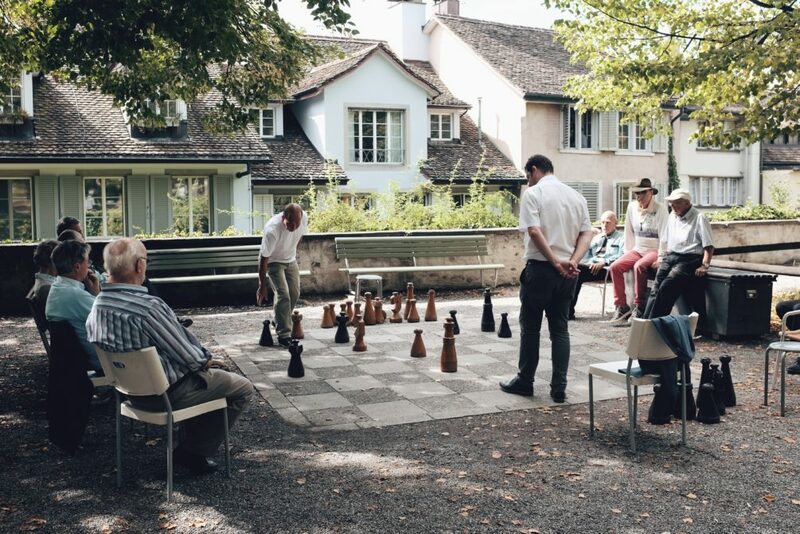 You might’ve heard that the big Swiss cities are boring and mainly for banking, but that’s not true. 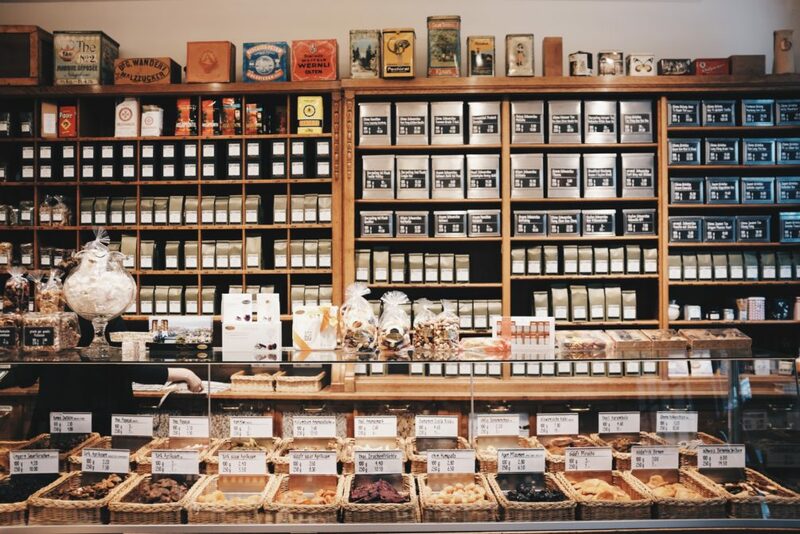 Zurich in particular is highly underrated and has the artisanal food shops, clothing boutiques and farm-to-table restaurants that are necessary for any top-tier city. 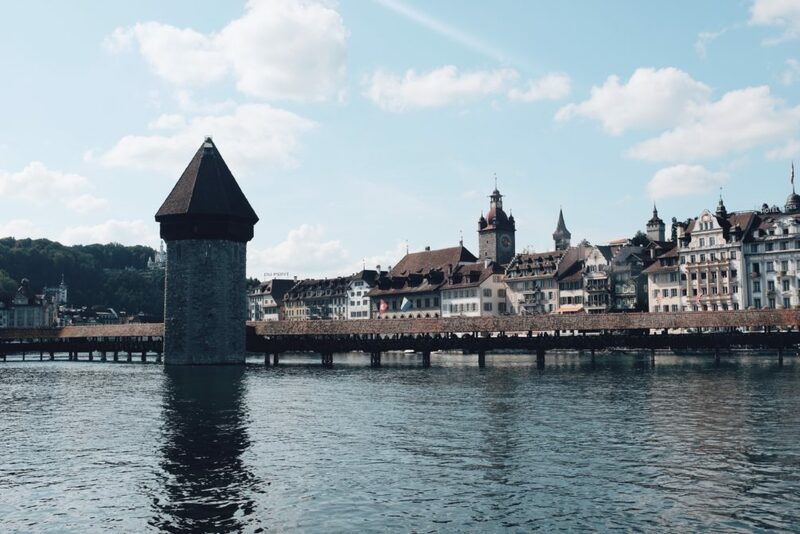 The following 4-day itinerary will help you narrow down Switzerland to a grand holiday of its essentials in the German regions – breathtaking mountain day trips, detours into charming small towns and a conclusion in big city Zurich. If that sounds a bit ambitious to do in 4 days, note that Switzerland operates one of the most efficient train systems in the world. 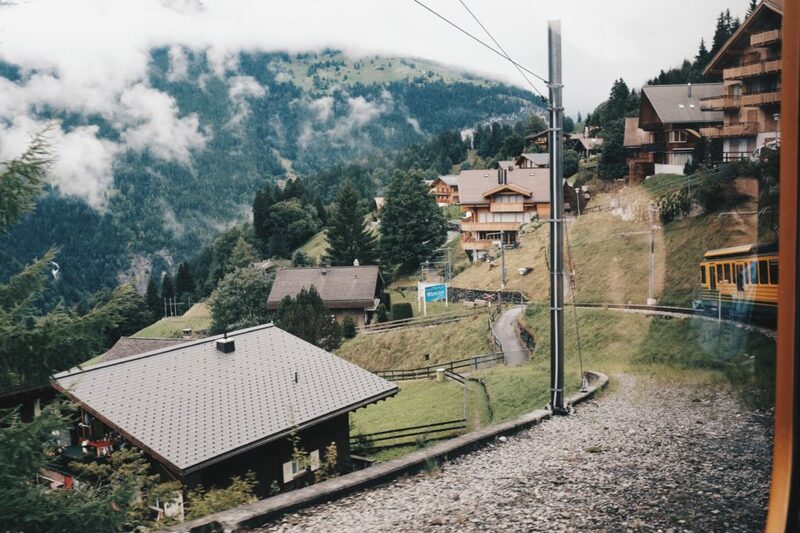 For some context, our train ride from Bern to Wengen consisted of four transfers, but I was never once stressed that I would miss a connection because everything ran on time, the layovers were reasonable and the tracks were all close together. Switzerland is a clean and well run country, although an expensive one, so I’d advise that you spend your money on hotels and sightseeing rather than on shopping (VAT is only 8%) and on food (entrees in general range from 20-30 CHF for lunch and 30-50 CHF for dinner, and what you tend to get is an unimpressive plate of meat and potatoes). I came back from Switzerland with a lot of photos, many memories and the obligatory bar of Swiss chocolate, but not much else! On the surface, Bern feels like a very small, sleepy Swiss city. You get the sense that people here are on the older side and are living a comfortable 9-to-5 schedule. The main attractions, not surprisingly, are a bit old-school in nature. Visiting Albert Einstein’s old flat or walking through the Rose Garden are considered some of the top things to do here. So for the first half of the day, embrace the traditional. Take the requisite leisurely stroll of Old Town, a well-preserved medieval townscape that’s also a UNESCO World Heritage Site. 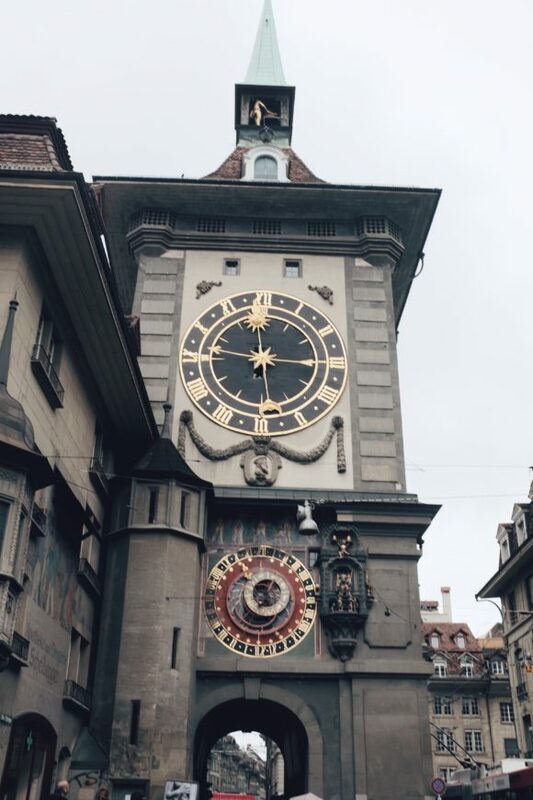 You can start from the train station and make your way east, where you’ll pass the Zytglogge clock tower, the Parliament building and the Bern Cathedral. 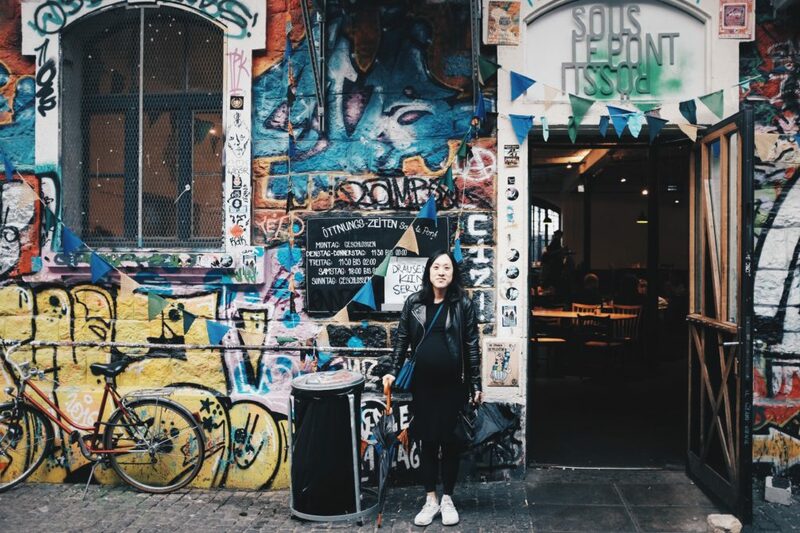 You’ll appreciate the pop of color from the historic landmarks in a part of the city that tends to feel gray and uniform. 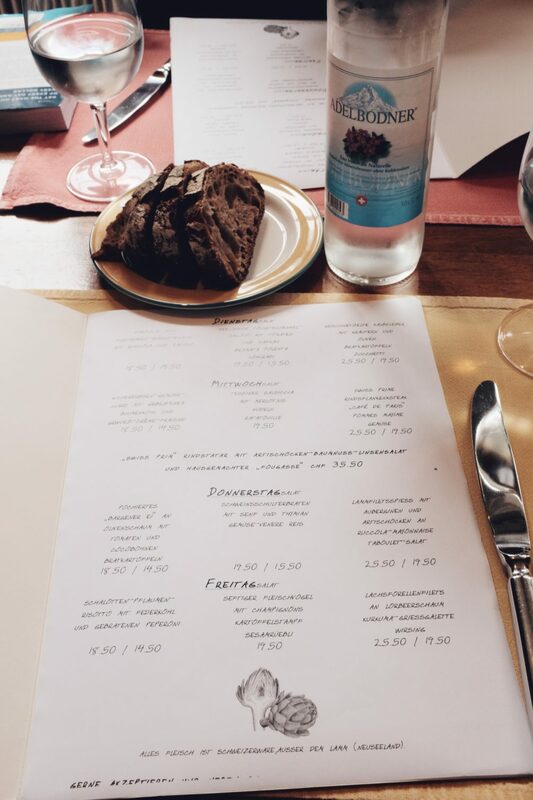 If you want to break for lunch, you can stop by Metzgerstübli for a homey, traditional meal that’s reasonably priced for Swiss standards (entrees are ~19.50 CHF). The crowd is evenly split between locals enjoying a long, leisurely lunch and hungry tourists. 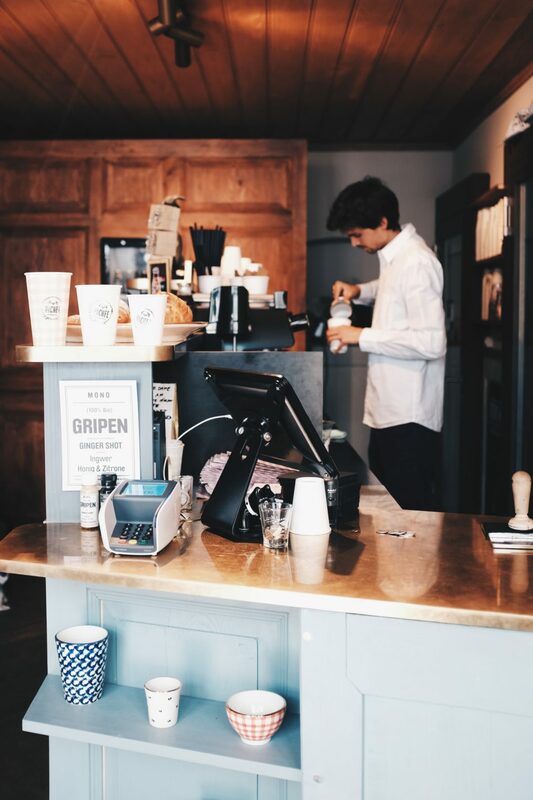 There is no English menu, but the staff will be more than happy to try to translate the items for you. Again, traditional Swiss food tends to be very meat and potatoes heavy, so be aware that this lunch will be very dense and filling. 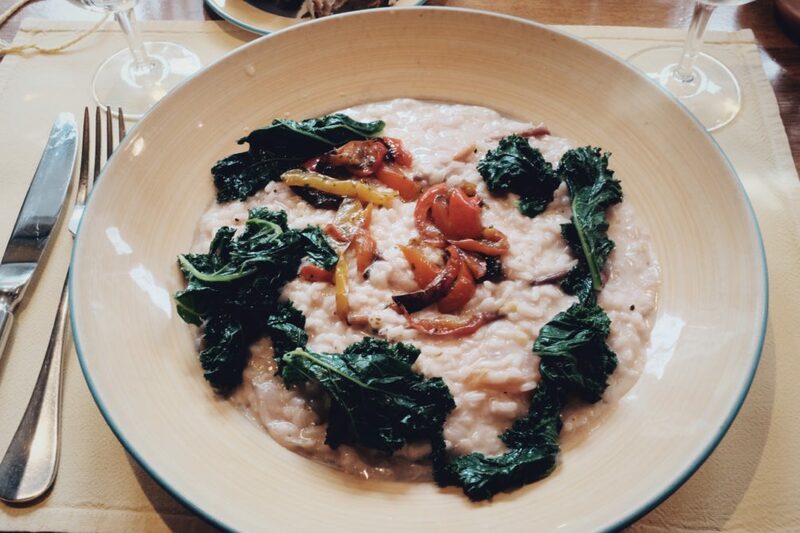 Our risotto, for instance, was extremely rich, while the plate of sausage and potatoes tasted exactly as it would sound. 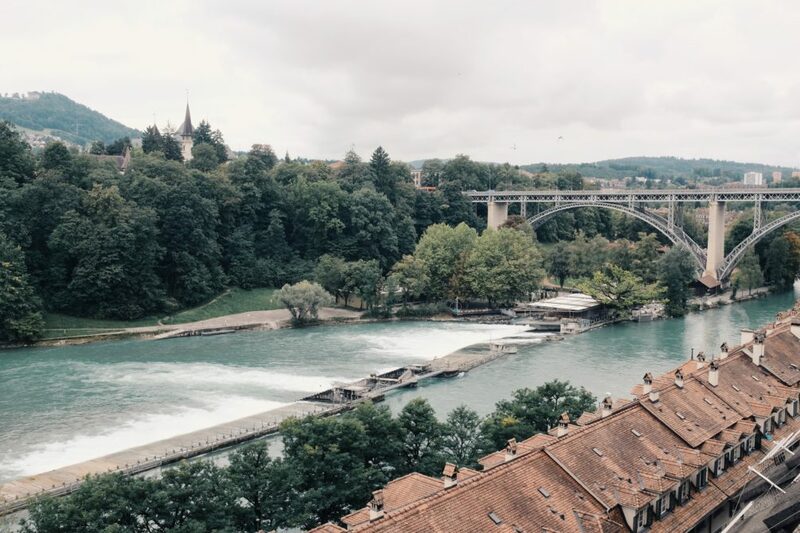 One of the most rewarding spots on the walk is Münsterplattform, a scenic outdoor terrace that affords great views of the city and the Aare river. 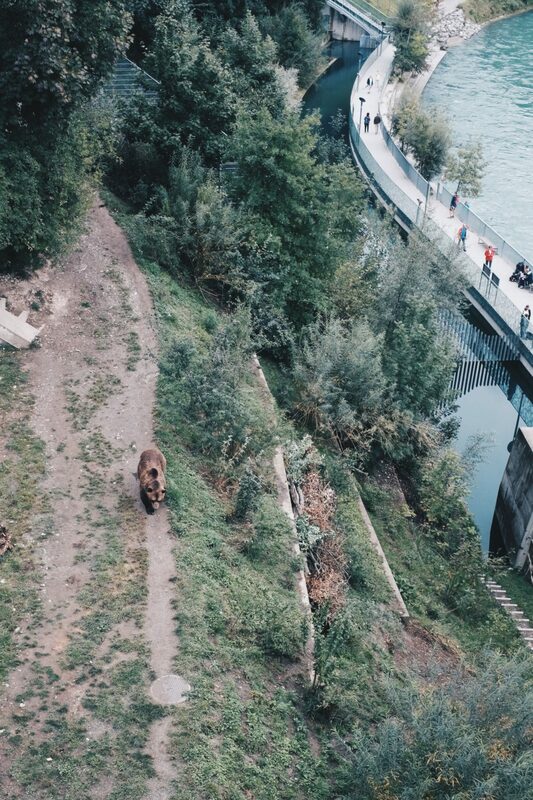 You can even see the bears of Bärengraben down below strolling through their spacious, natural digs. If only all animals in captivity could live like this. 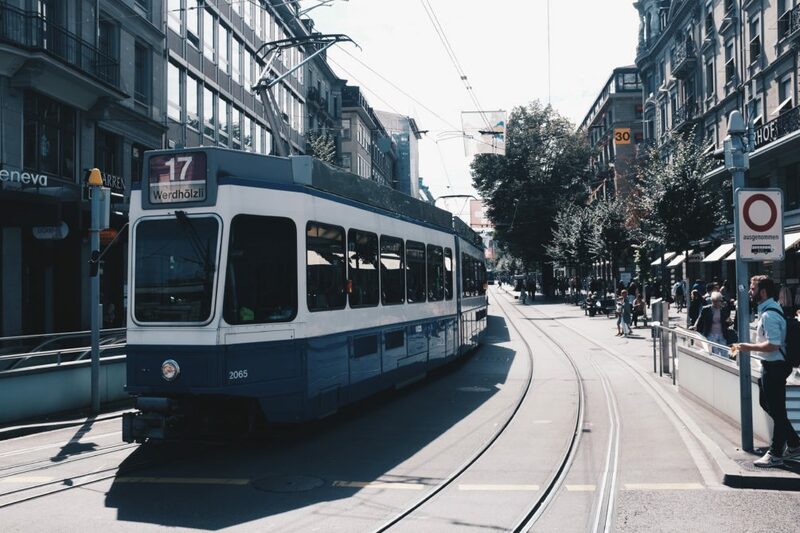 As your day starts winding down, you might be wondering what the nightlife options are in Bern. In a quaint, medieval town inhabited by older, government workers, you can probably bet that there isn’t much nightlife to speak of. But this is where your stay in Bern takes an oddball turn. 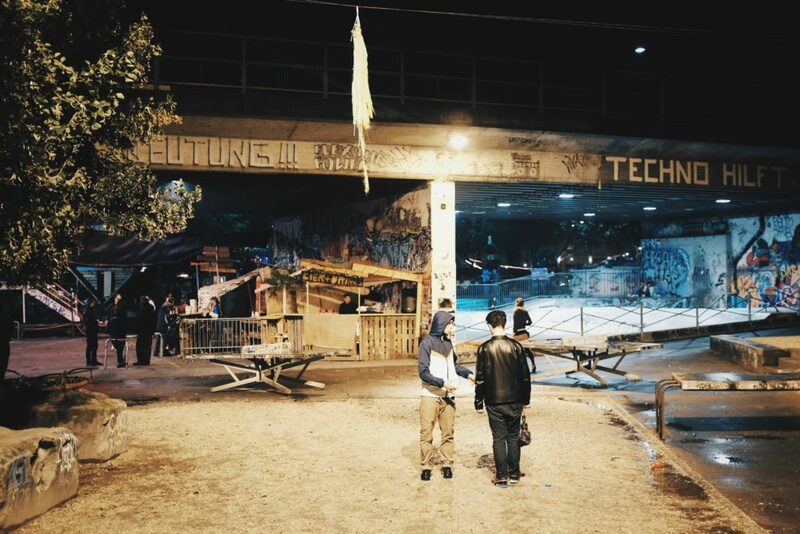 In this squeaky clean, sleepy city, there is randomly a grungy, graffiti-streaked complex called Reitschule where the anarchists and counterculturists hang out. You would have never thought that leather-jacket wearing, dreadlock-sporting left wing people existed in Switzerland, yet here they all are. In the complex is a restaurant called Sous le Pont, where I had surprisingly one of my favorite meals on my trip. 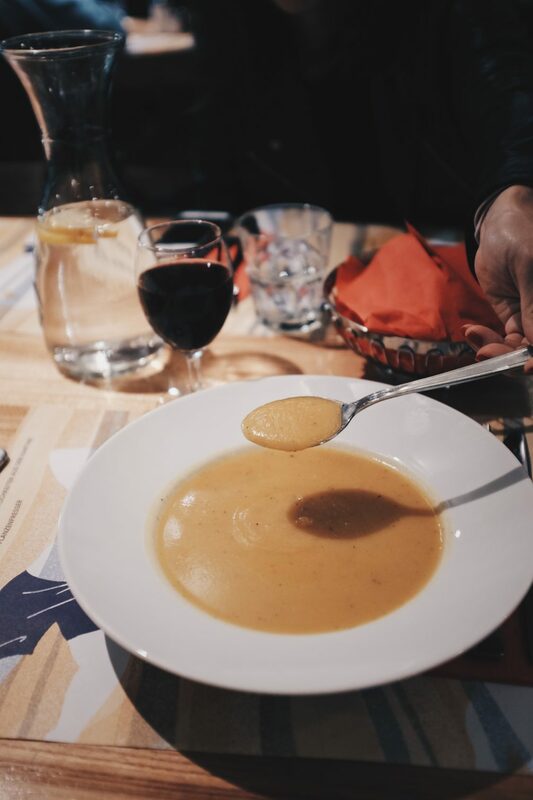 I think the novelty factor of stumbling into this unexpectedly grungy part of Bern was part of the reason why the dinner at Sous le Pont stood out, but the scrappy food was also very good and much more interesting than a traditional Swiss dinner. 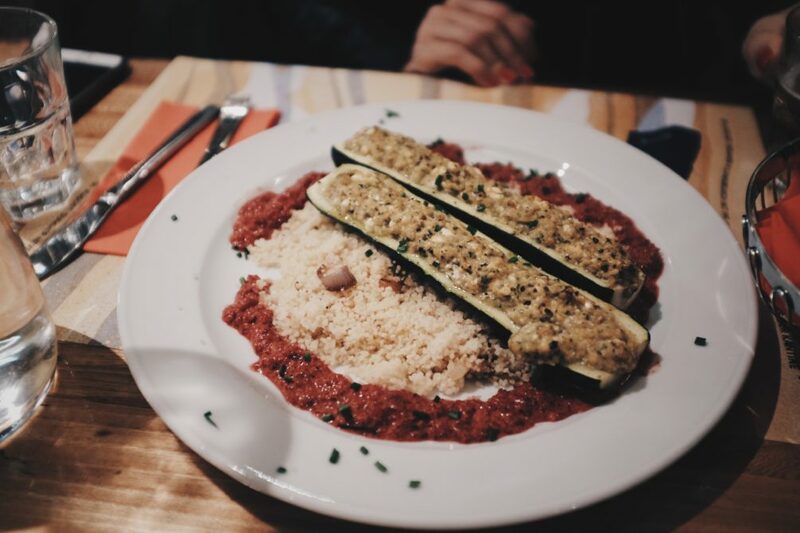 Rebellious lifestyles and vegan/vegetarian diets oftentimes go hand-in-hand, and that may explain why the vegetable entrees at Sous le Pont were the best. 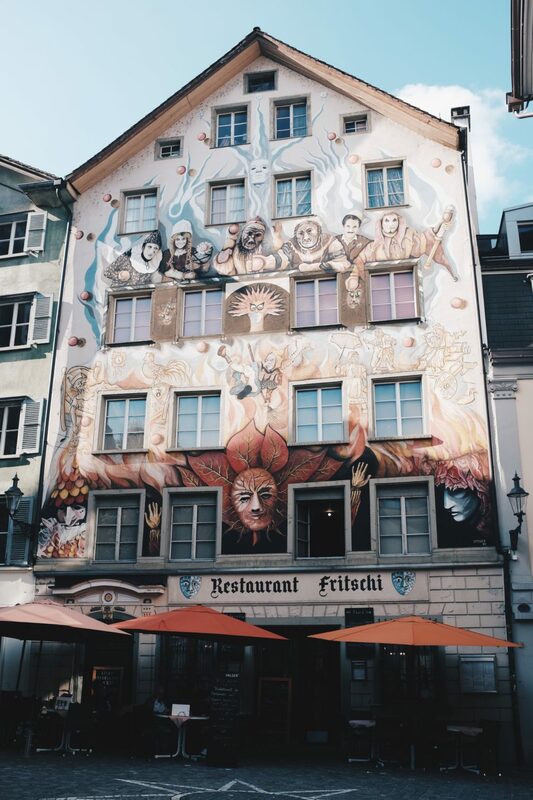 So don’t be afraid of the graffiti, step inside and experience a side of Switzerland that you won’t see very much of on the rest of your trip. 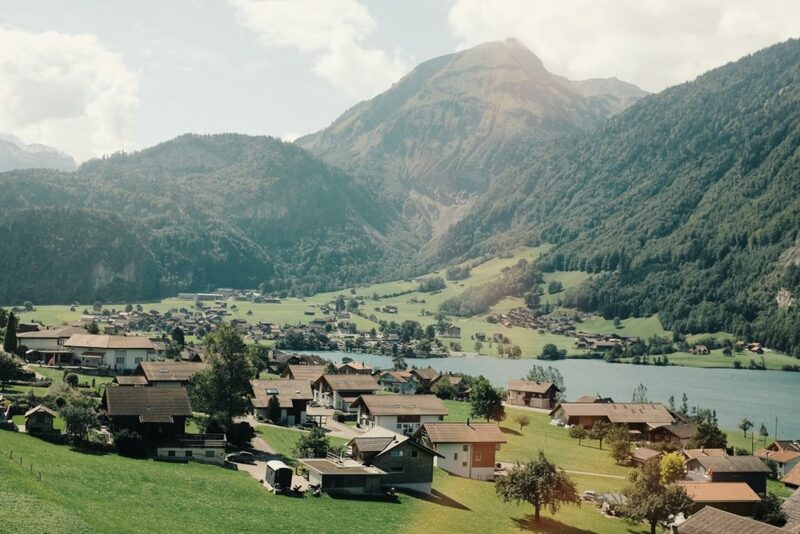 This leg of the trip is where you can take in the picturesque natural landscapes that Switzerland is famous for. 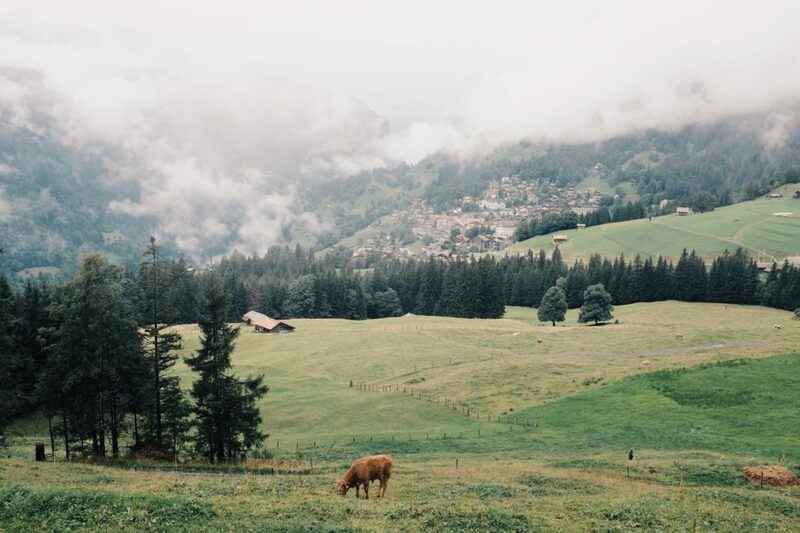 There will be no shortage of rolling hills, ice-capped mountain ranges and grazing cows during your train ride from Bern to Wengen. 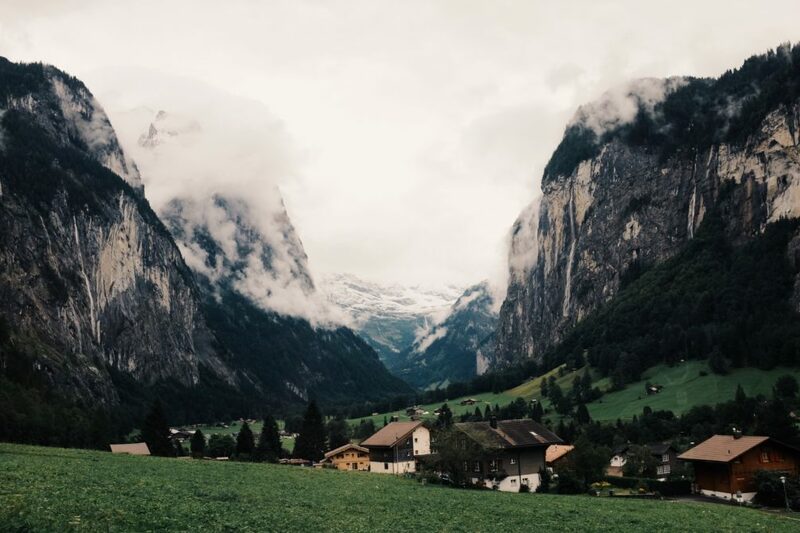 The topography of the Bernese Oberland can change quite dramatically with just a train ride or two, so be prepared for all kinds of weather. It’s quite possible to go from a light rain trench to a heavy duty ski jacket in just a single day. 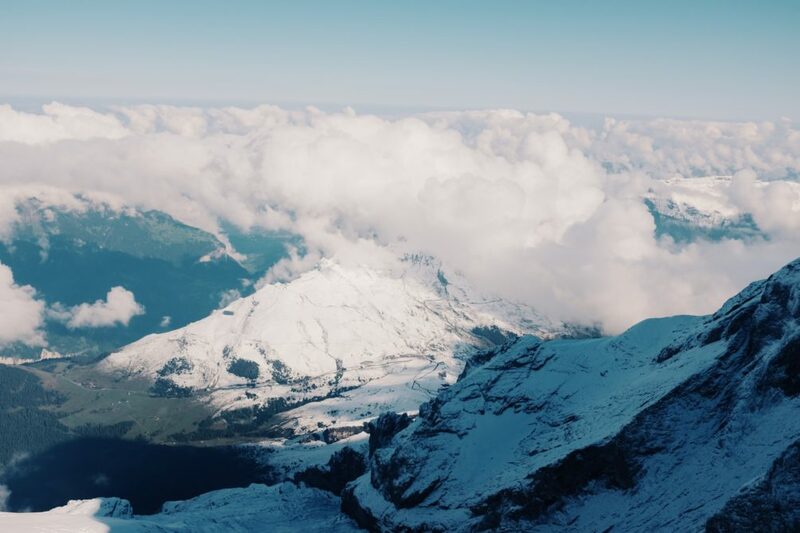 If you only have a day to spend, and the weather permits, you should definitely head straight to the top of Jungfrau, which is one of the highest points in the Bernese Alps. 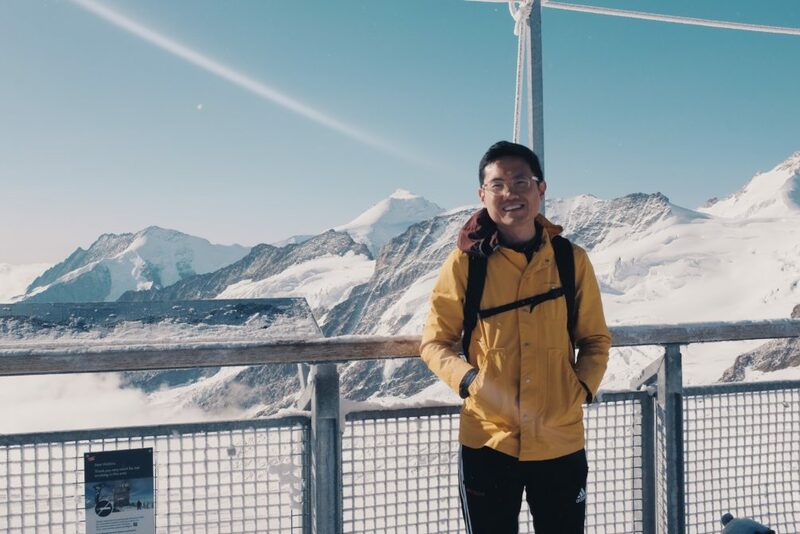 Wengen is a good base from which to make the ~1 hour trip to the peak, although there isn’t much to do in the town itself. 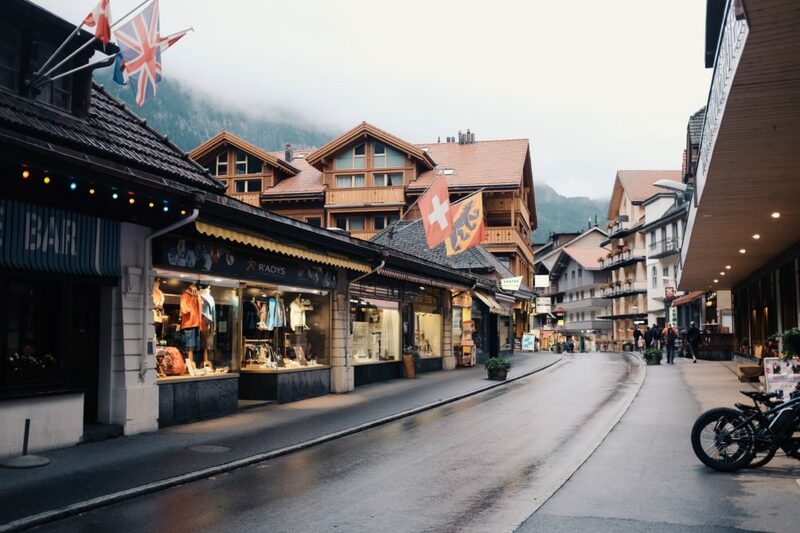 When we arrived in Wengen, it was raining nonstop, so we had to postpone our trip to Jungfrau for the next morning. 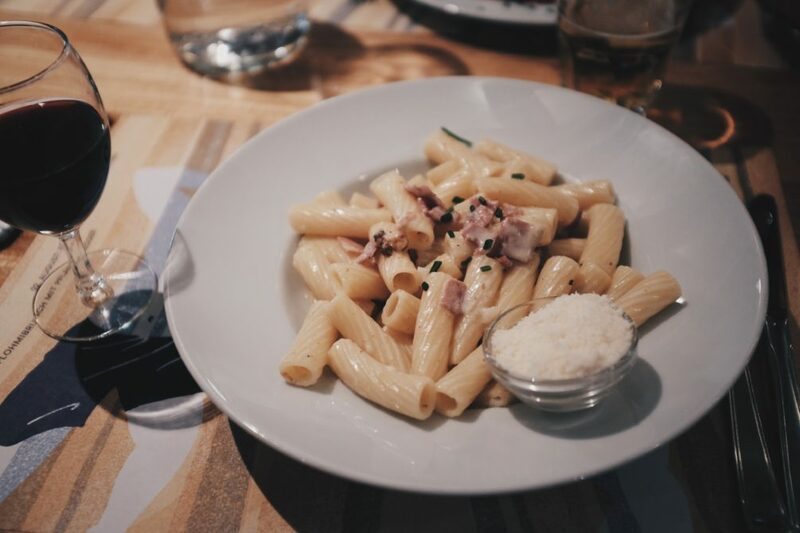 The silver lining to the rain delay was that it gave us time to venture into the Allmend railway station, where we had one of the best meals of our trip at nearby Bergrestaurant Allmend. It may sound crazy, but the bowl of Thai curry chicken over rice was amazing, and even my healthy chicken breast plate was fantastic. 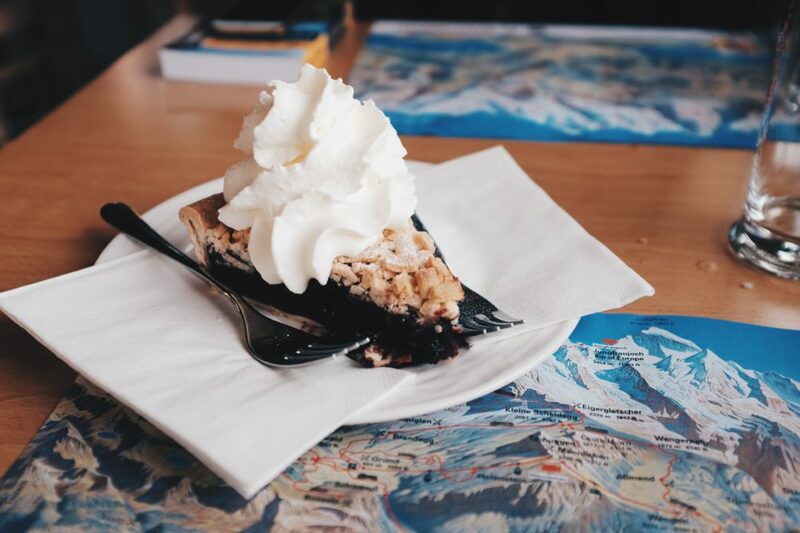 Food at a ski lodge can sometimes be an afterthought, but that’s not the case here. 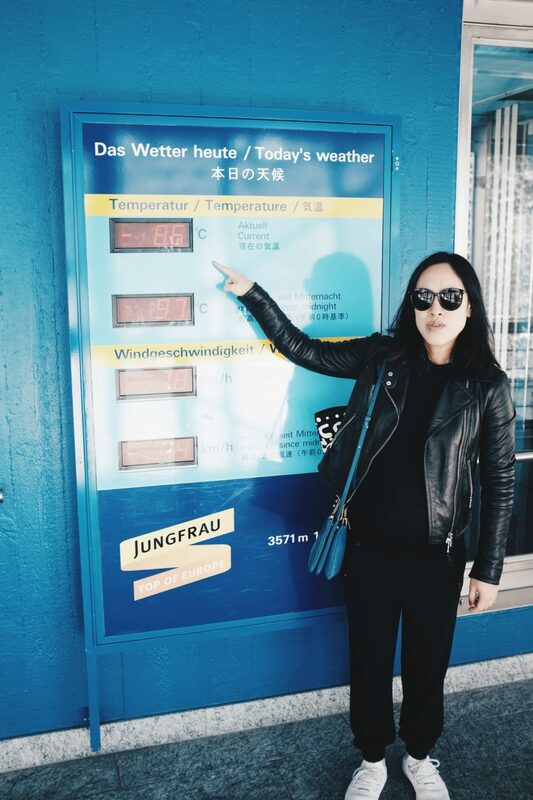 We took a gamble on the weather the next morning and bought our tickets for Jungfrau. Each ticket cost about 210 CHF per person, which isn’t cheap, but we got a discount with our Swiss Half Fare Card. Luckily the weather complied, and we were able to see all the different lookout points very clearly. Once you arrive at Jungrau, you should allow yourself ~1.5-2 hours to spend at the top. 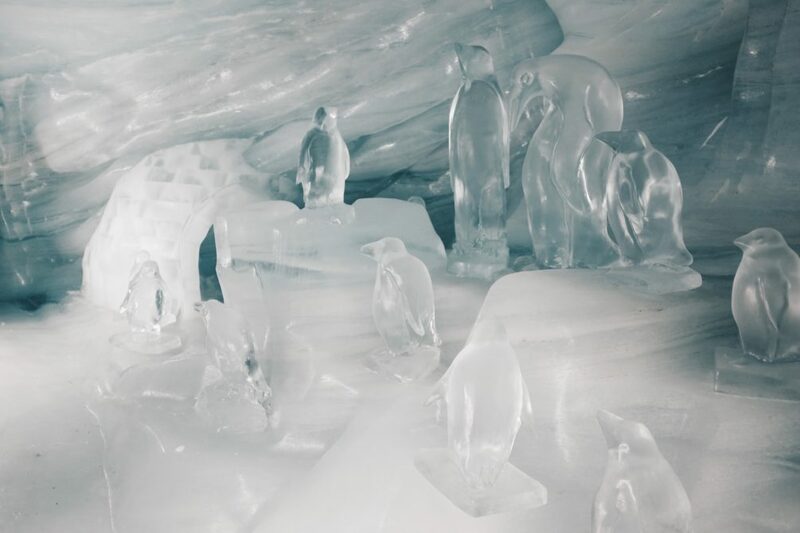 There’s obviously the obligatory outdoor lookout point where you can take selfies with the snowy mountain tops, an ice sculpture exhibit that you can glide through, an immersive 3-D simulation of being at the top that you can participate in and a Lindt chocolate store where you can stock up on sweets. 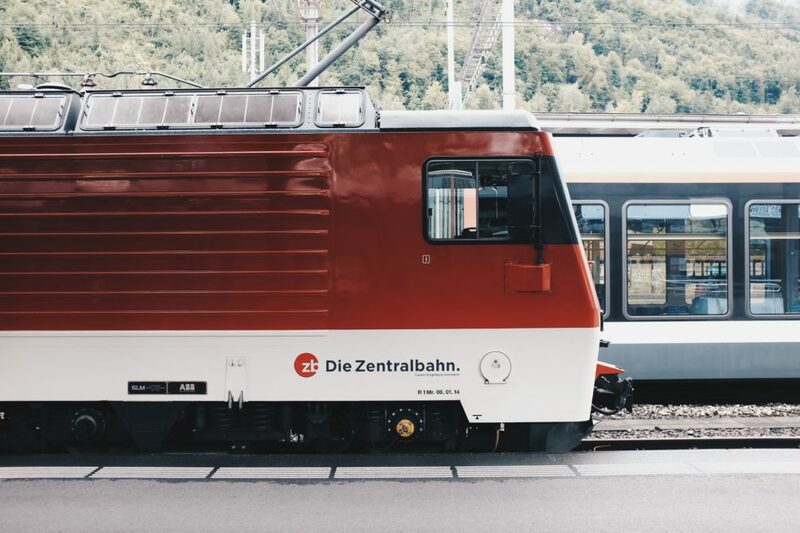 It’s better to go either extremely early or later in the day, as the crush of tourist groups can make the experience unpleasant, and the train fares at these times are also cheaper. 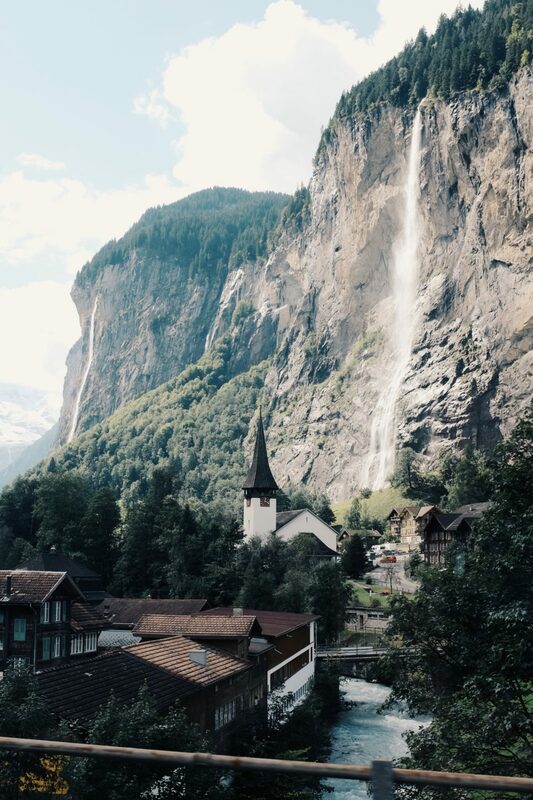 One of the best parts about leaving Wengen will be the scenic Golden Pass train ride between Interlaken and Lucerne, your next stop. The photo ops will be numerous as you pass by small, beautiful towns that are lucky enough to have magnificent mountains as their backdrops and to be situated next to the bluest and most pristine lakes. And of course, there will be plenty of peaceful, grazing cows. 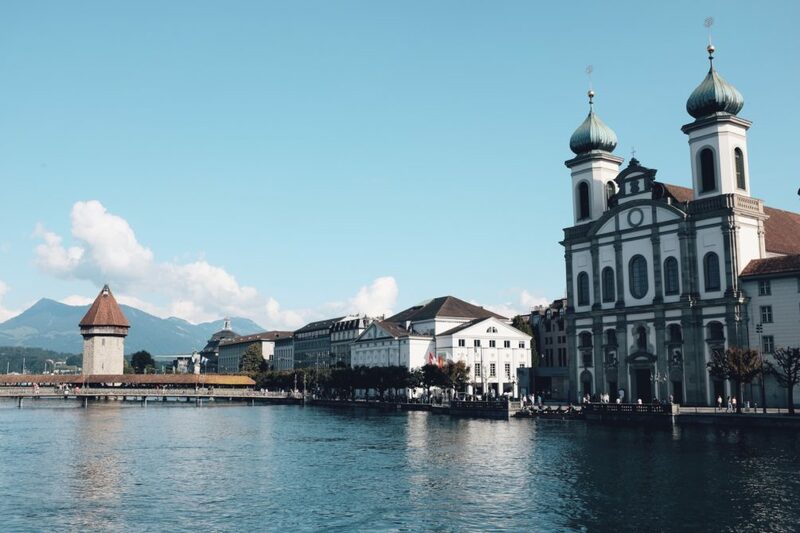 Lucerne is another quaint city that’s popular on a lot of Switzerland itineraries. It’s not the most dynamic place in the world (it is compared to Bern, but the bar is low)…something about it reminds me of San Diego, where it’s clear you’re somewhere pleasant but there isn’t a whole lot to do. The scenic lookout points along the pristine Reuss River, though, make for some nice walks. 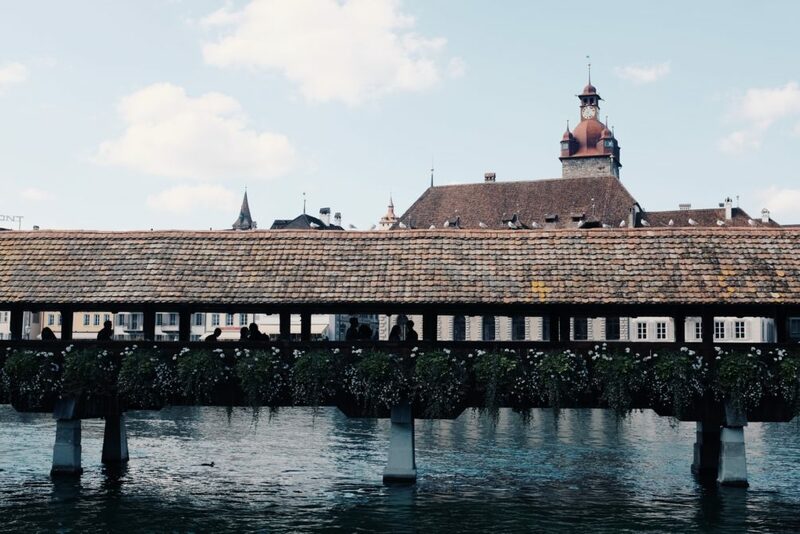 You’ll likely spend your day walking along the river, crossing the famous Kapellbrucke or Chapel Bridge and peering at the medieval images painted on top, and stopping at various spots in the old town area. Like any proper European city, there is a church to see, in this case, a Jesuit Church built in a Rococo style. Literary buffs might be excited to see a sign pointing out that the writer Goethe once stayed here. 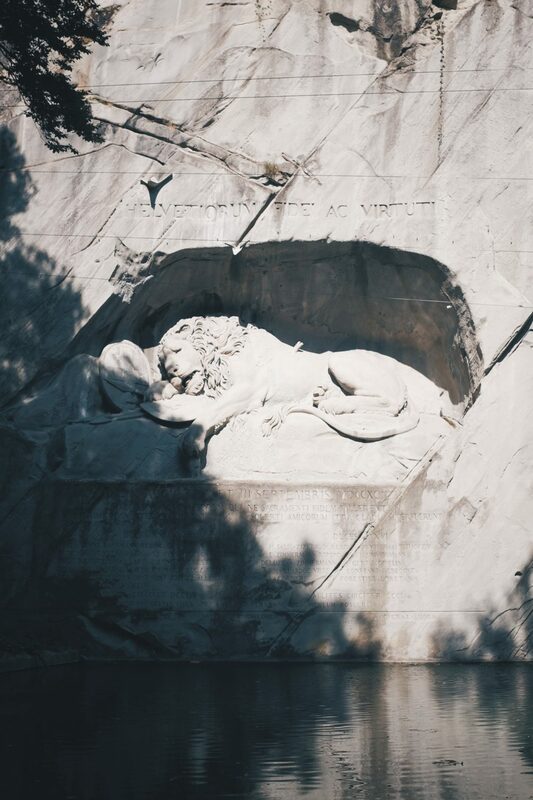 One of Lucerne’s most famous sights is the Lion Monument, which depicts a large lion weeping as he lays dying from a spear in his side. 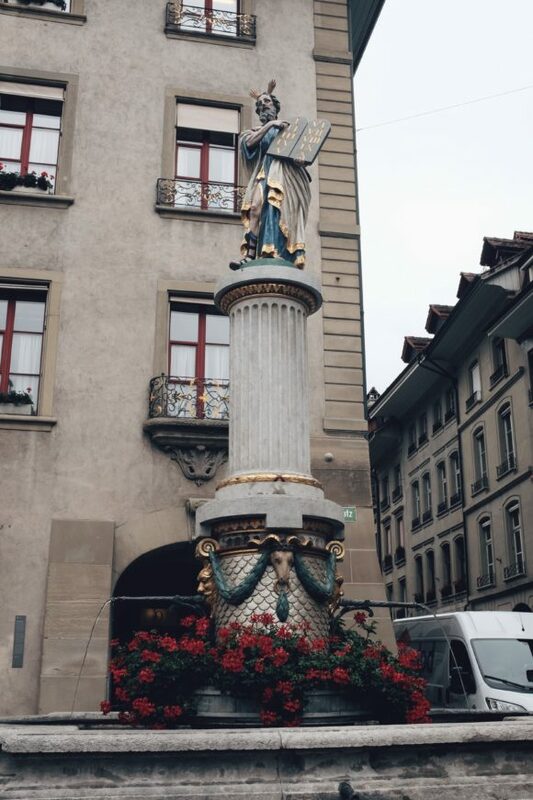 It’s a bit of a walk from the main city square, but it’s one of those items on a Lucerne bucket list that you have to check off. The monument was built in honor of the Swiss mercenaries who were killed defending the French king during the revolution. Come take a picture and then head back into town. 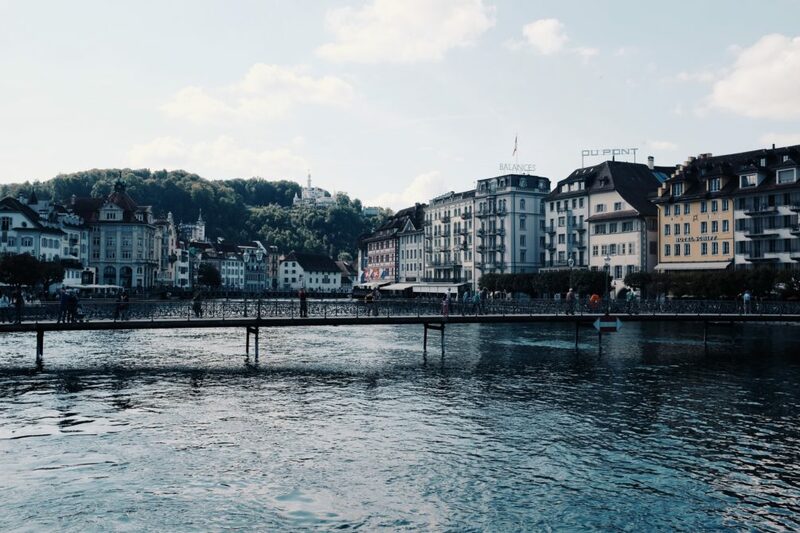 It seems like the thing to do in Lucerne on a nice day is to sit by the water and grab some drinks. 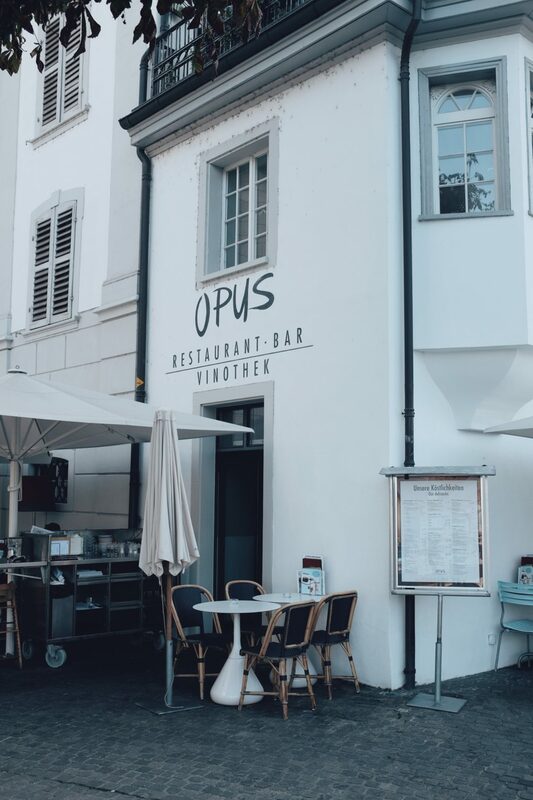 We stopped by the restaurant Opus and sat outside eating some tasty chicken wings and french fries. 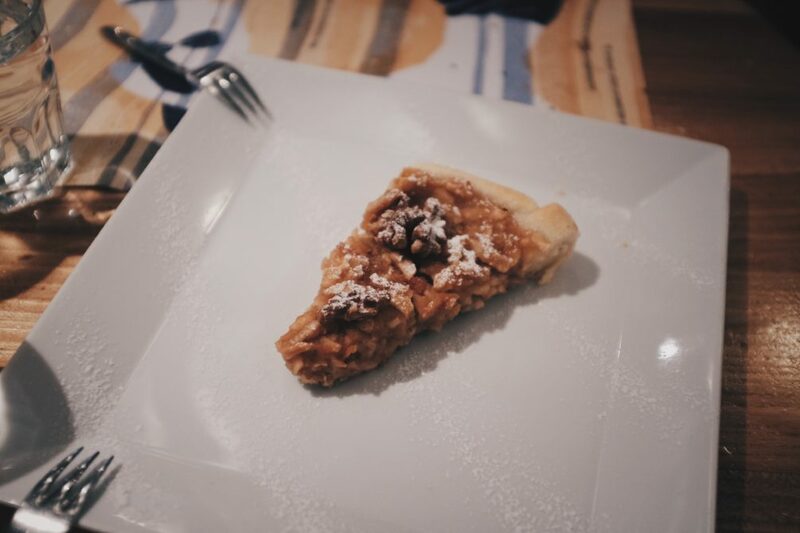 One thing to note about Lucerne is that food is not one of its strong suits. That unfortunately means that I didn’t have very memorable meals to report back on. 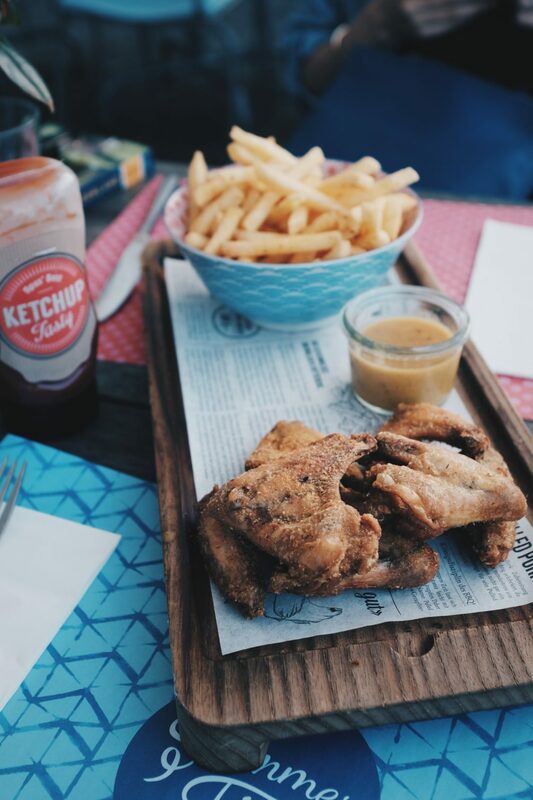 But I do recommend the chicken wings and the salad bar at Opus. 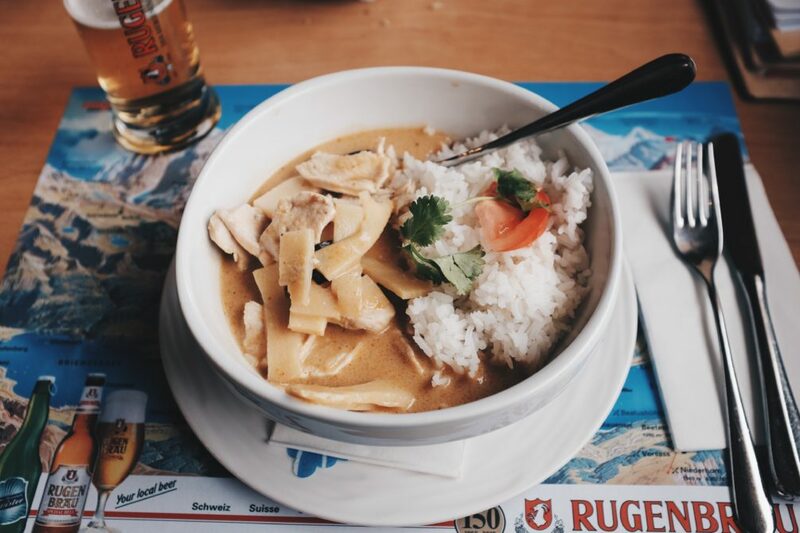 Better meal options await you at your next stop in Zurich. Zurich gets a bad rap as a boring banking city, but I don’t think it’s deserving of that reputation. True, it lacks the character and charm of a Paris, but it’s clean and pretty, and there’s enough to do for a weekend. Especially if you like living the high life. 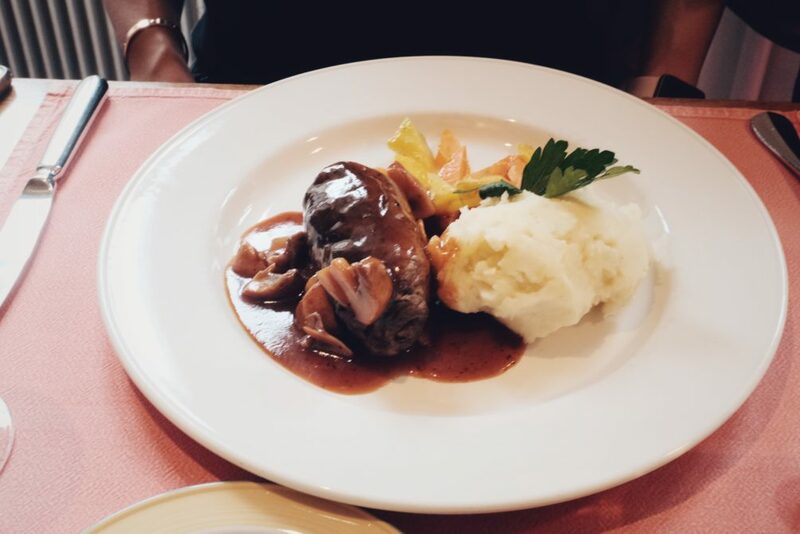 There are many nice boutiques and expensive restaurants where you can blow your money. 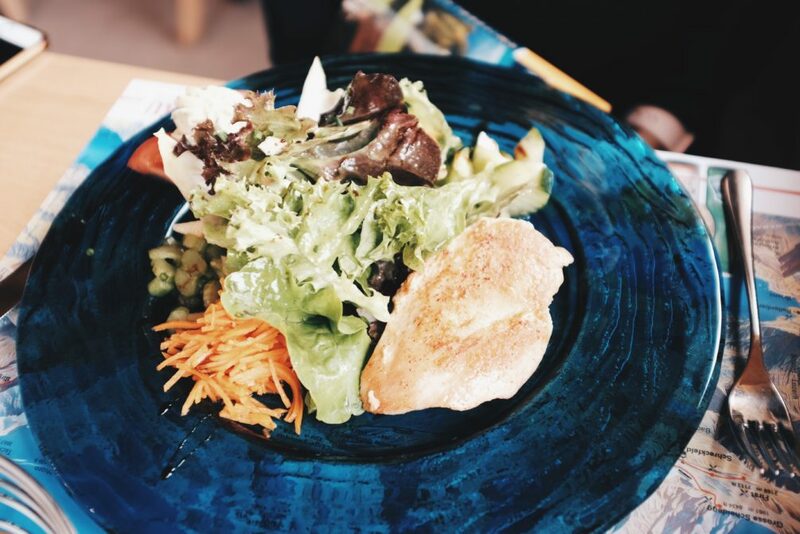 And most importantly, the food in Zurich is so much better than the rest of Switzerland. 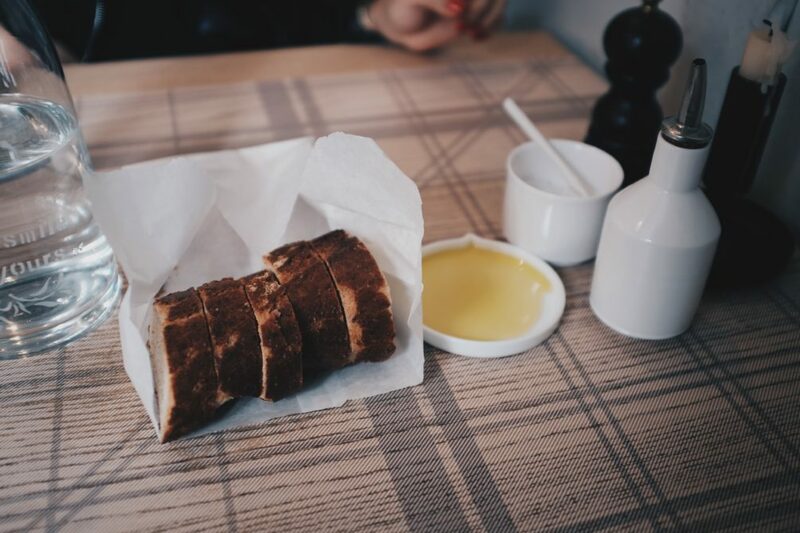 You can actually find a few farm-to-table, seasonally driven restaurants that are on par with something you’d find in San Francisco or Copenhagen. 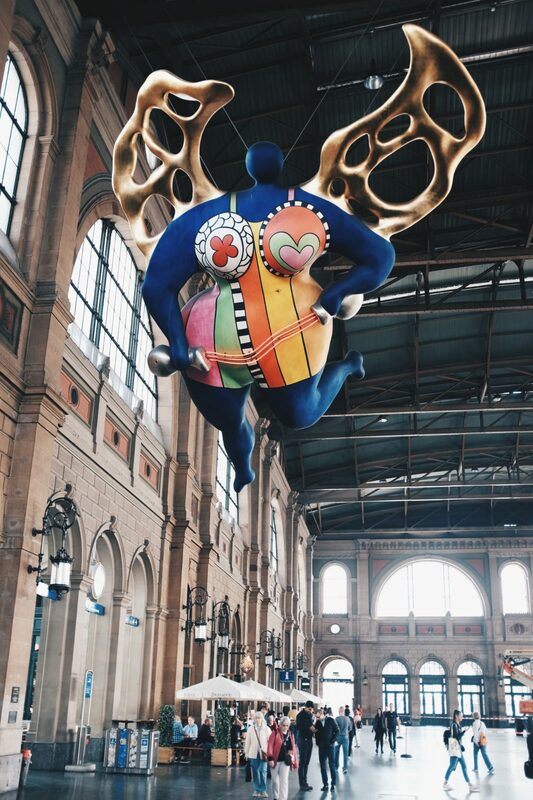 We stayed at the Park Hyatt in Zurich, which is apparently the best Park Hyatt in the world, but I personally found the one in Vienna to be more visually impressive. I did like our room, which truly did feel like a luxurious home away from home, and although the fitness center was small, they did provide free bottles of water and Powerade, and the small steam room and sauna were more than adequate. 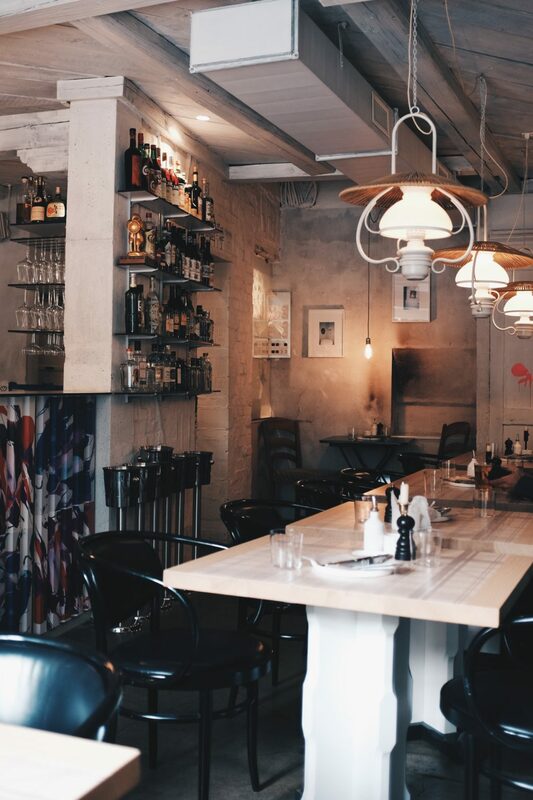 First thing on our agenda was to eat lunch, and after a lot of research, I settled on Maison Manesse, which was described as a modern and informal brasserie known for its experimental cooking. Sure enough, when we arrived, I felt like I was in Brooklyn somewhere rather than Switzerland, and even the style of food was very similar. 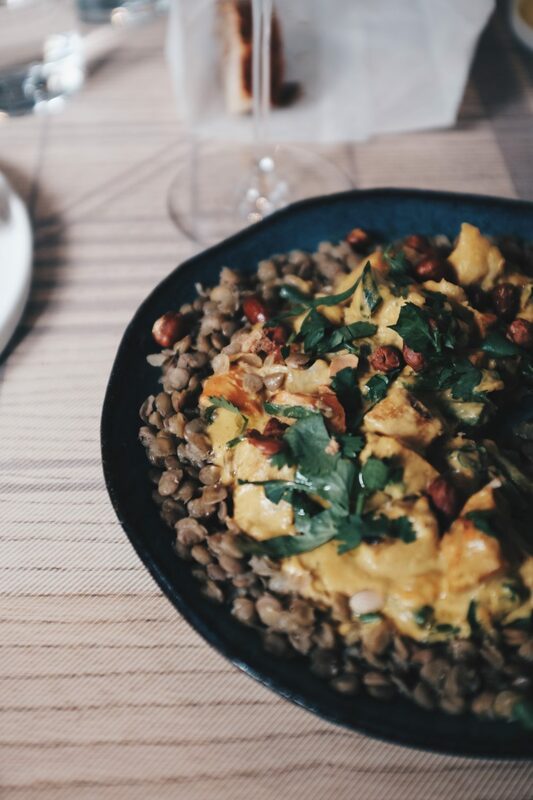 The lunch menu included seasonal and simple items like a salad with salted beets and goat cheese and a roasted pumpkin curry with cauliflower and lentils. 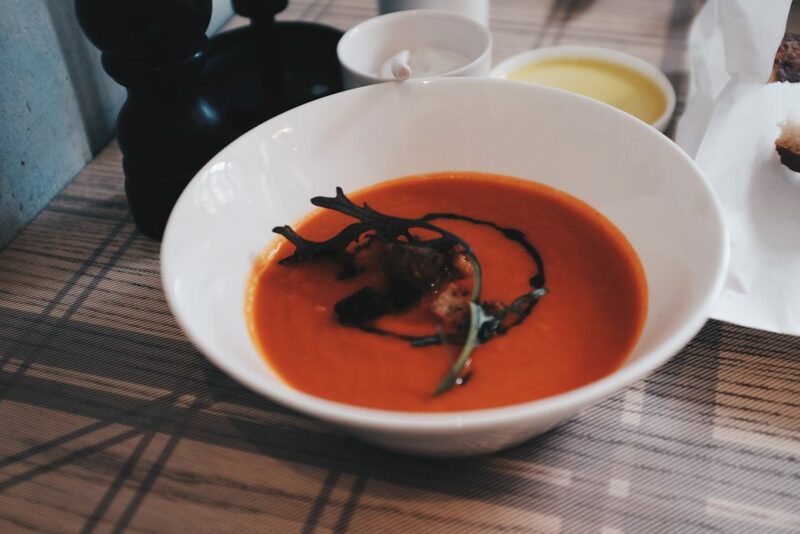 I loved my tomato soup, which was deep and plummy but also a little spicy, and the Scottish salmon was cooked with an impeccably crispy skin. I suppose the tasting menu at dinner is where things get a little more interesting, but I was more than happy with the straightforward set lunch menu. Afterwards we went back to the train station to start our walking tour of Zurich. 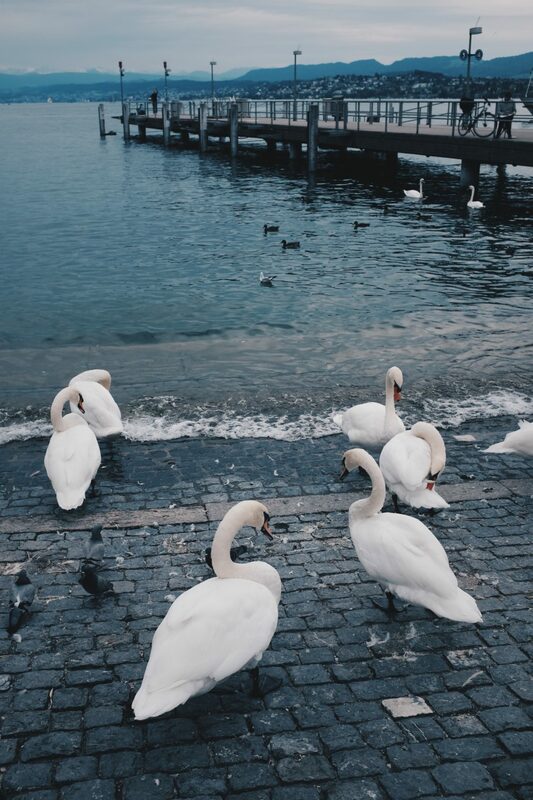 Zurich is also situated around a lovely lake, which makes for a scenic walk. 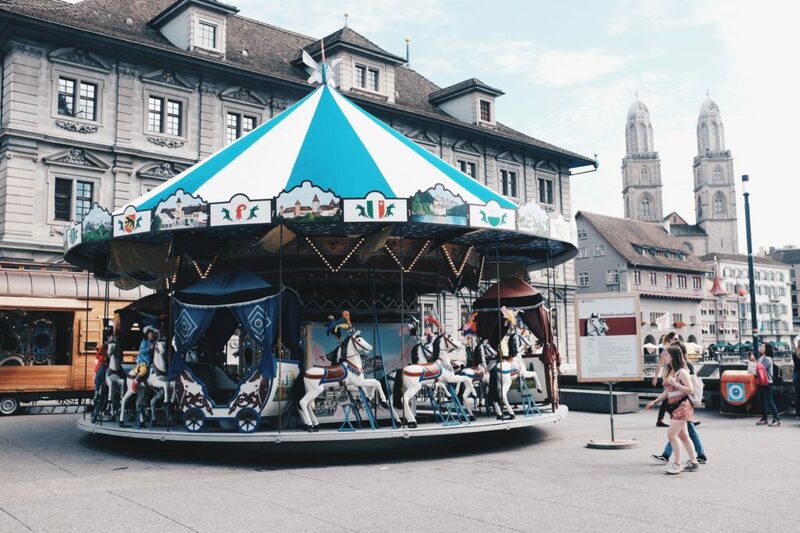 One of the highlights of the walking tour was spending some time in Lindenhof, a square that used to serve as a base for important forts but is now a park with beautiful views of the city. 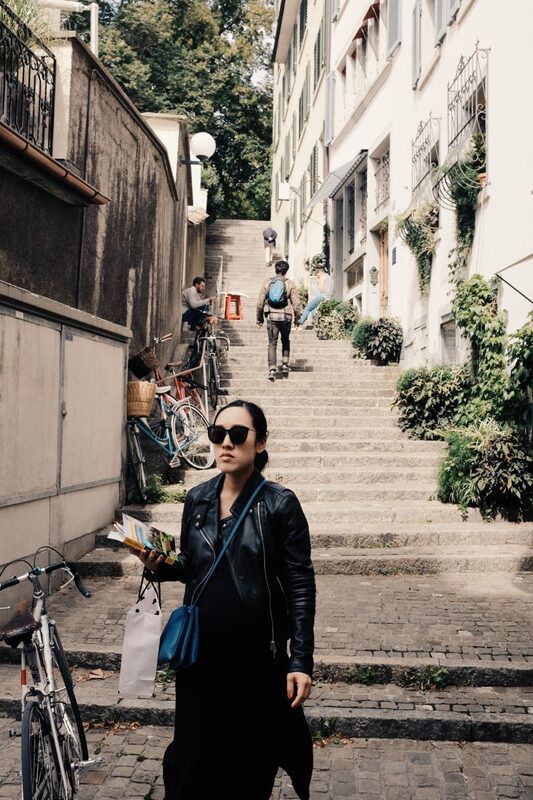 As we left Lindenhof using the stairs in the back, we stumbled upon a small, artisanal coffee shop called ViCafe that made a great flat white. 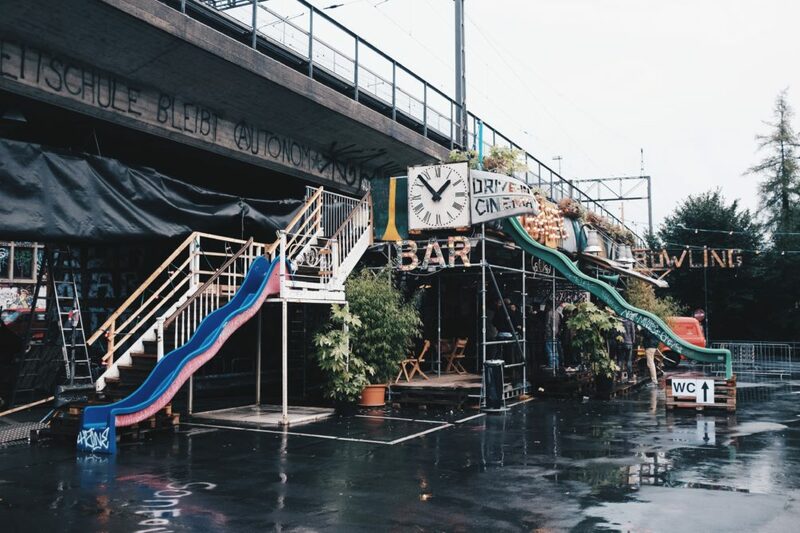 Again, loved the fact that you can find quirkier, twee establishments in Zurich. 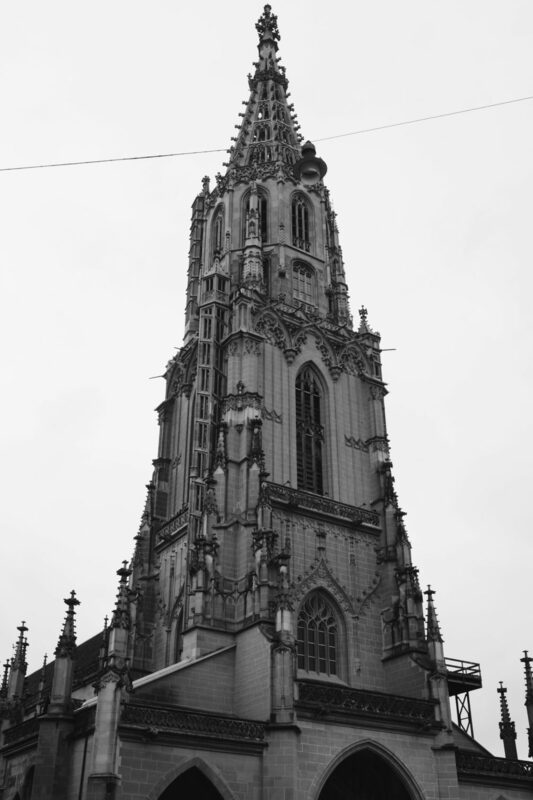 Zurich also has a church to speak of–St. 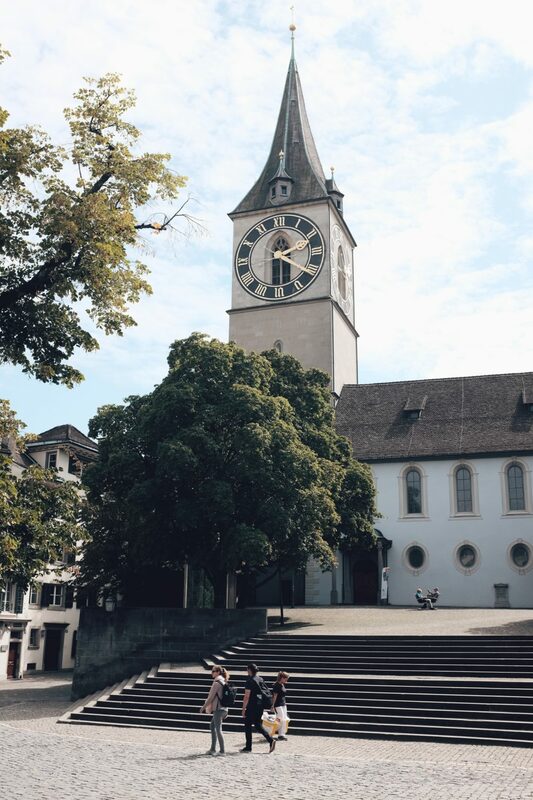 Peter’s Church, to be exact–and it’s known for having one of Europe’s largest clock faces. 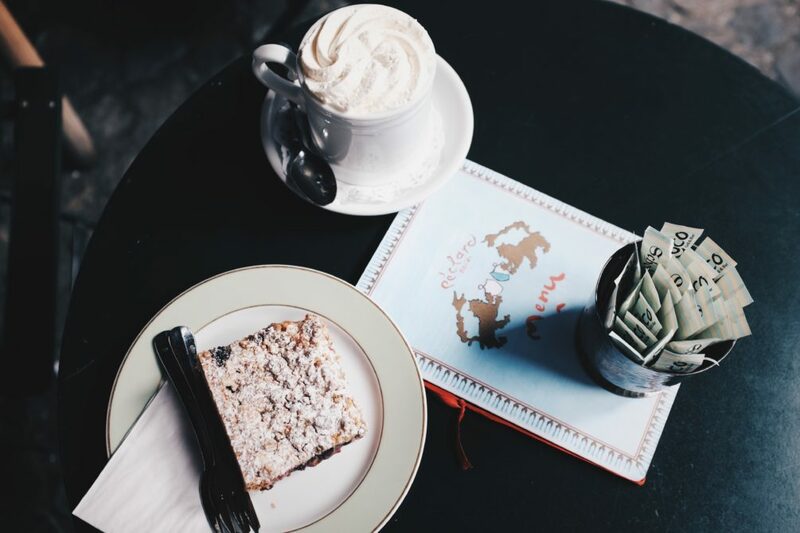 Truthfully, though, I was more excited to browse at Schwarzenbach, a specialty grocery store that reminds me of Russ and Daughters, and having hot chocolate and a crumble cake at a high-end bakery parlor called Conditorei Schober. 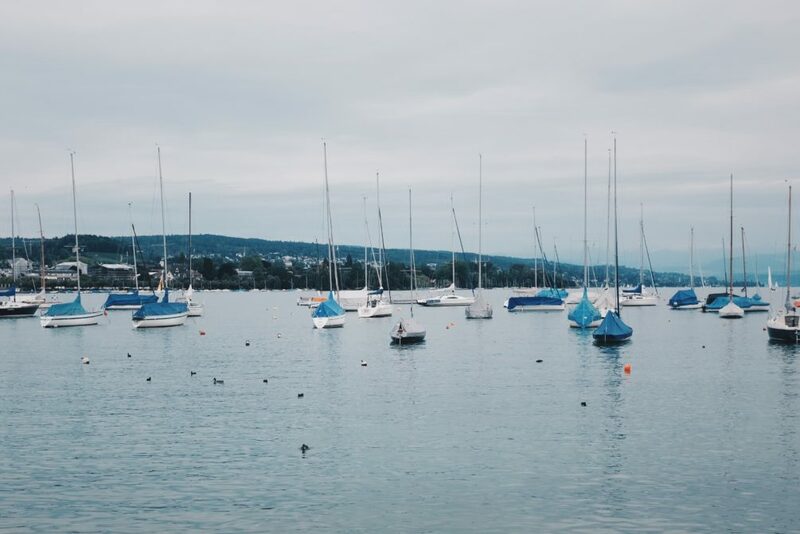 A tour of Zurich wouldn’t be complete without going on a boat ride on Lake Zurich itself. Once at Burkliplatz, where many of the boats are docked, you can choose from either an actual cruise or a commuter riverboat-bus. We opted for the latter, since our Swiss Half Fare card got us a discount, and we didn’t need a long, extended ride. The riverboat-bus doesn’t come with any commentary, but it does allow for a quick and scenic loop around the lake. 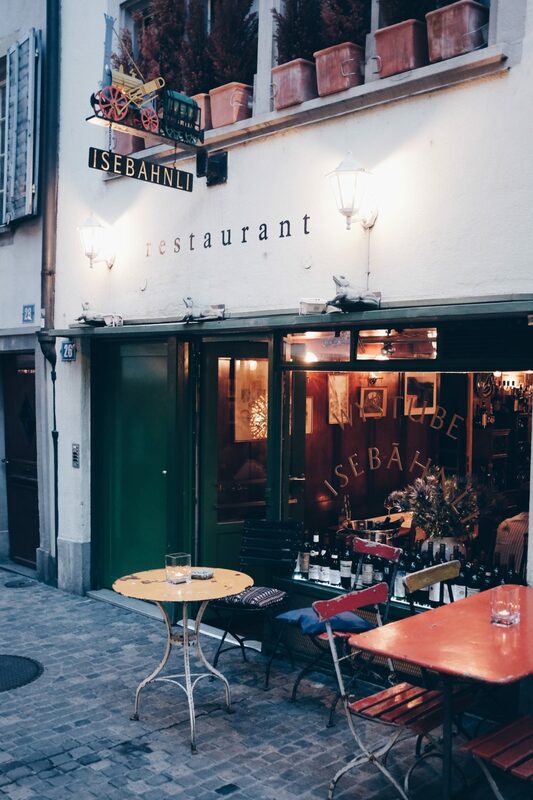 For our final meal in Zurich, we went to Isebähnli, a family-run restaurant that takes a seasonal, market-driven approach towards cooking. 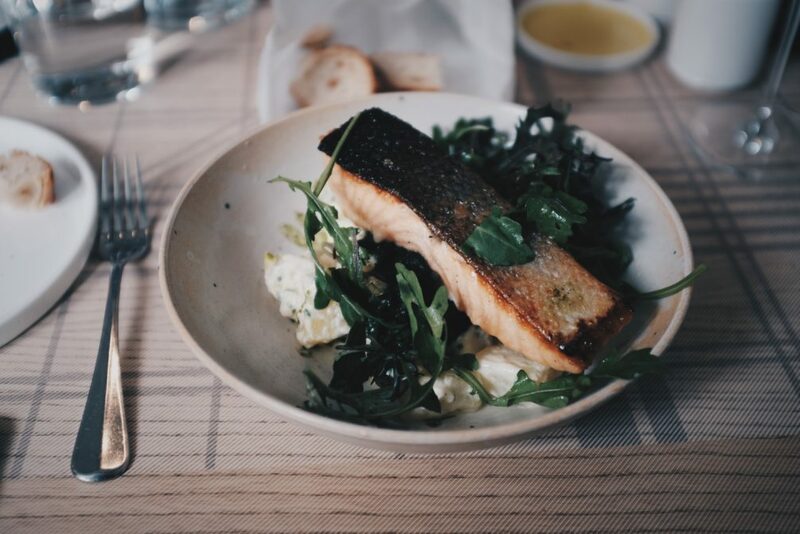 The food here was a refreshing change from the traditional plates of meat and carbs that seemed to be the norm in Switzerland in general. It’s a small and cozy looking bistro that seats about ~20 people inside, most of them locals who are fans of the food and the wine program. Dinner consists of a 5 dish tasting format featuring fresh ingredients and incorporating unexpected flavors that will leave you floored. It was a great way to end our trip with a splurge meal that was definitely worth it. For a longer write-up, click here.